This starts Camberwell Illustration's children's book blog. 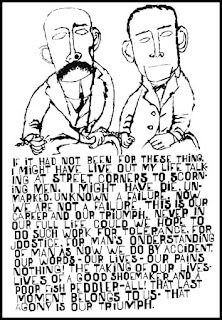 I passed some time in the library and found some magical stuff including this, illustrated by Ben Shahn. 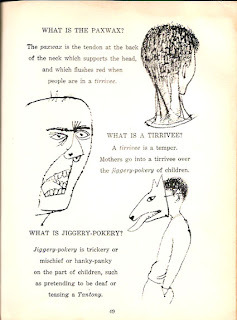 I was introduced to his work on my Foundation Course with a book called 'Love and Joy About Letters'; it registered because of his total drawn language that combined English and Hebrew hand-rendered type (see bottom image) with figure-objects in really concrete, self-contained compositions that sat in page-space. 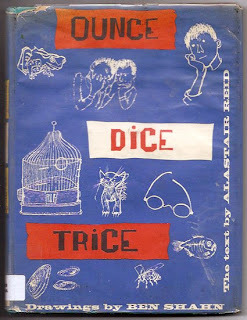 I wish 'Ounce Dice Trice' had used his hand-lettering instead of printed type but the word-sound-play idea for this book is very interesting and the 'thingness' of Ben Shahn's simple drawings are a perfect counterpoint. 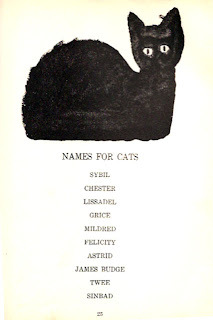 There are some good cats in the book and I think for children that drawings which can encapsulate the 'catness' of cats for example are valuable. Something to do with observation and editing. I'll be adding more bit by bit but please join the group and add your own examples which will feed our work on the Macmillan project and children's book work generally.